For kids, it’s almost impossible to picture Easter without colored Easter eggs. Yet, for children and families affected by egg allergies, many miss out on this quintessential tradition altogether or they substitute fake plastic eggs for real ones. 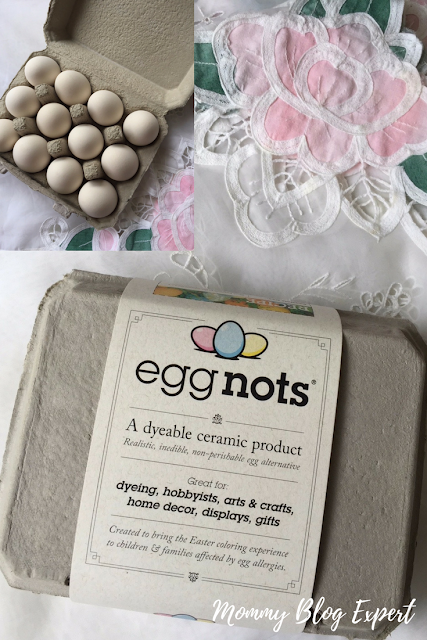 Thank goodness there are Eggnots, a dyeable ceramic product (pictured above and featured throughout this post) that looks and feels like real eggs and comes packaged in its very own cardboard egg carton. These realistic non-eggs were especially created by the brand to bring the fun Easter egg dyeing and decorating experience not only to allergy suffering kids but to enable hobbyists who want to create lasting family egg-shaped heirlooms. Though these are made of ceramic and will break if dropped on a hard surface, Eggnots still are more sturdy and durable than actual hard boiled egg shells. This makes them equally engaging for kids and adults to dye and decorate. An added plus is that since this is an inedible and non-perishable egg alternative, these "eggs" are a crafter's dream and can be stored for years as well as used for year-round home decor and arts and crafts. 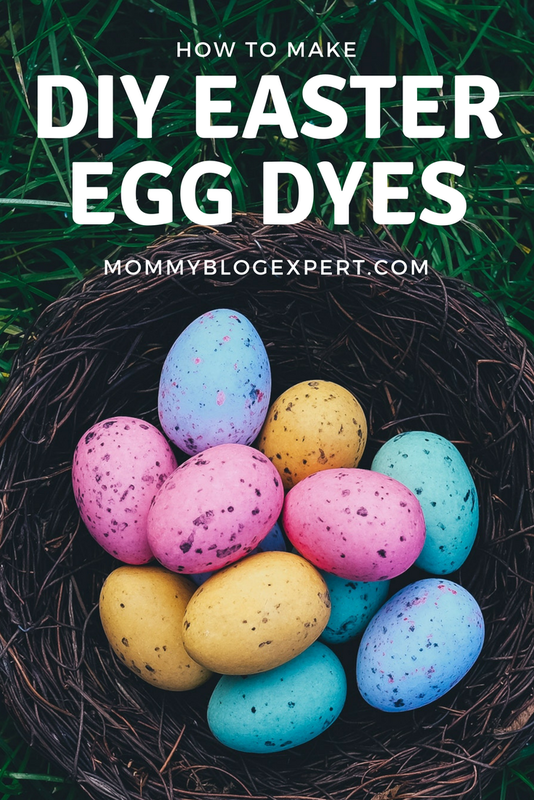 You can, of course, simply dye your eggs with regular food colors available at the grocery store using the free DIY Easter Egg Dye recipe found on the Eggnots package or here. 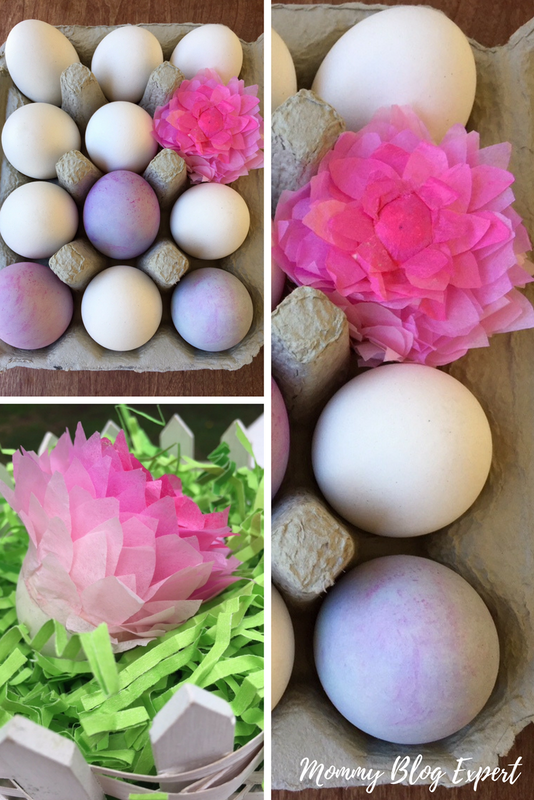 Alternately, check out How to Make Vegan Natural Egg Dyes. 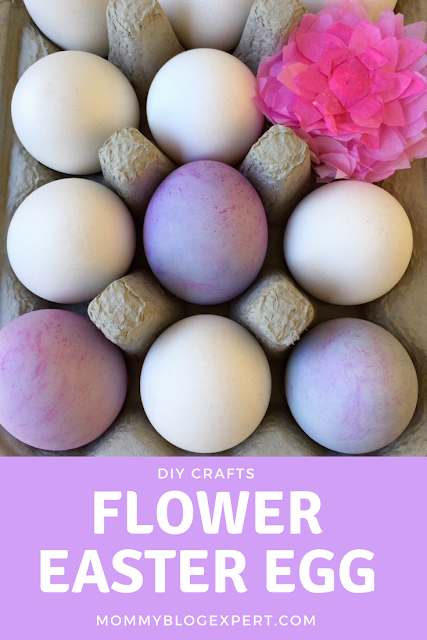 However, to really get your creativity flowing and make something special and beautiful, why not make MBE's original Blooming Easter Egg Flower? 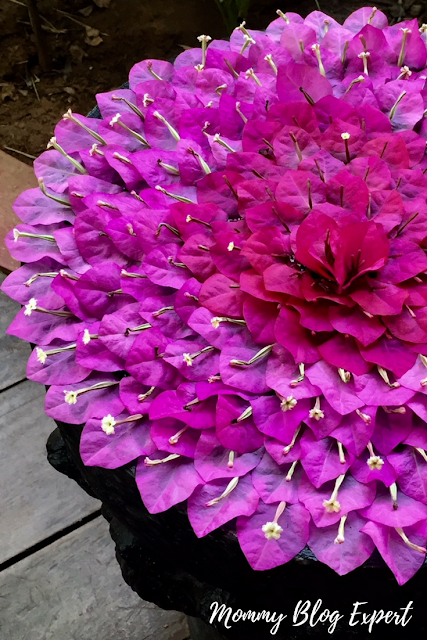 This craft was inspired by the natural colors of the beautiful bougainvillea flower petal arrangement below which we saw during a recent family vacation to Angor Wat, Cambodia. Not only is this an easy and fun craft project to make at home for parents to do with younger kids but also for older children (and adults) to do on your own. 1. Gather together all supplies before you begin and cover work surface to protect it. 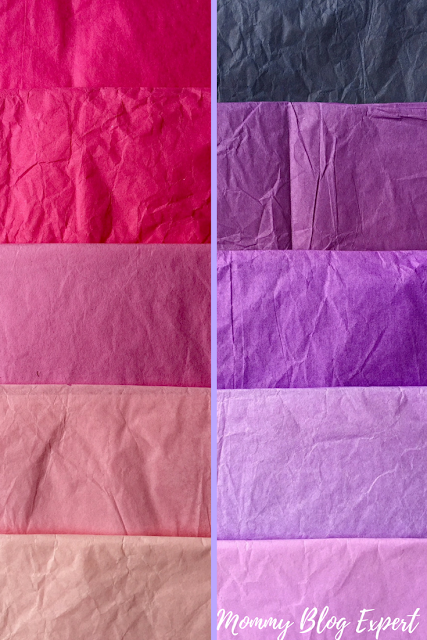 Sort your five shades of tissue paper from dark to light. 2. Make a light dot with a pencil on the top center of your egg. Then, using a measuring tape, from that dot measure down the length of the egg 2-inches and lightly draw a line around its circumference. 3. 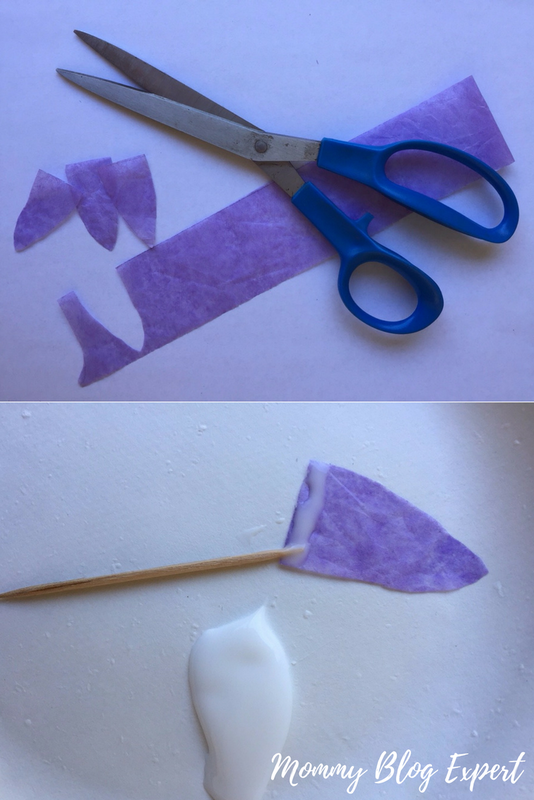 Cut tissue paper into strips to quickly and easily create consistent length flower petals, being sure to keep each color of petals separate. Starting with the darkest color, cut a tissue strip 1/2-inch wide, then working cross-wise freeform cut 12-15 petals; repeat using next lighter color cutting 15-20 petals. For the next three tissue colors, cut a 3/4 inch wide tissue strip and then cut 20-30 petals cross-wise out of each. 4. Using the darkest color, trace a penny and cut out a circle 2 layers thick. With a toothpick, apply glue lightly, gluing the two paper circles together. 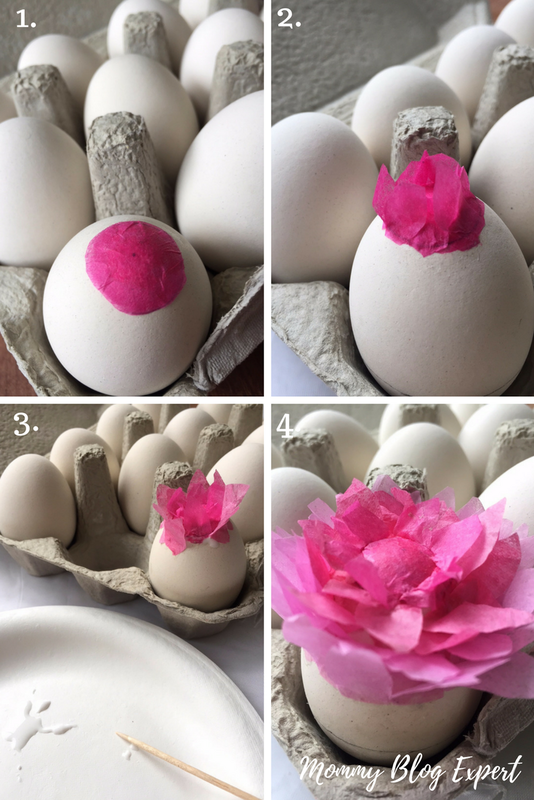 To create the flower's center, use the toothpick with a small amount of glue to then center the glued together piece over the dot on top of egg. 5. Start with the darkest tissue paper at the top make a narrow line of glue with a toothpick along the bottom straight edge of each petal and glue to egg, layering petals slightly to cover egg completely in rows around the egg. Continuing to work from darkest to lightest color, layering two rows of each petal color around the circumference of the egg. 6. Finish with the lightest color tissue petals, covering the pencil line you drew on the egg in step #2. If needed, you can add a third row of petals to completely cover the line. 7. Allow glued on petals to dry completely, then gently fluff with your finger tip from top to bottom so petals are 3-dimensional, like a real flower. Enjoy your flower art eggs singly or by the dozen! 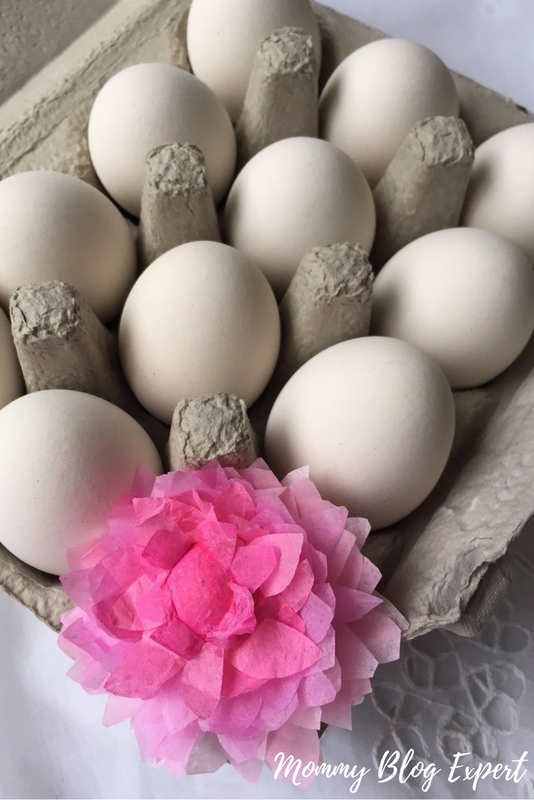 Eggnots realistic, inedible, non-perishable egg alternative, are a dyeable ceramic product for Easter Egg dyeing and spring holiday crafts as well as perfect for hobbyists, home decor, and year-round arts & crafts projects. Created to bring crafting with eggs to children and families affected by egg allergies. Made in the USA, Eggnots are available in 6-, 12- and 18-egg cartons ($9.95-$21.95) exclusively online at Eggnots.com. Learn more on the official website as well as follow the brand on Facebook, Twitter and Instagram. FTC Disclosure: MBE received product and/or compensation to facilitate this post. See complete FTC Disclosure information that appears at the bottom of MommyBlogExpert's main page and at the bottom of every individual post on this blog, including this one. Hadn't heard of eggnots before! I guess that would make it easier to use from year to year!